I recently finished two audio books that on the surface don’t have much to do with each other, but upon reflection, I realized they both exposed major biases I didn’t know I had and forced me to rethink my views. 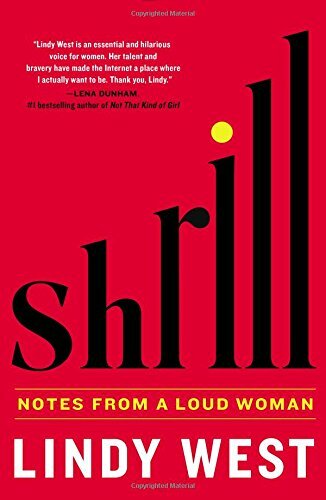 Shrill is one of those books; I'll be back in a few days to tell you about the other. These posts actually make me squirmy to write because it’s hard to admit I harbor these prejudices, but hiding them or pretending they don’t exist won’t make them go away. And that is the goal, definitely—to make them go away. But here's my uncomfortable confession: I had no idea before reading West’s book that I had a bias against fat people. For much of my adult life, I’ve been generously proportioned myself. I didn’t realize it was possible to be biased against a group I myself have been a part of, but now I know better. I’ve held the belief, though never overtly acknowledged it, that fat people deserve to be looked down upon or judged, and if they didn’t want that judgment, they should lose weight. So basically, I thought that fat people needed to meet a certain standard before they deserved to be treated like human beings. Of course, when I phrase it so baldly now, the idea sounds horrific—and it is. But I hadn’t ever interrogated those latent beliefs before. West is an outspoken feminist advocate, and as such is a target of the constant vitriol of Internet trolls, but she somehow continues to fight the good fight with dignity and a healthy dose of sarcasm. She’s also a master of tone, considering she’s able to deliver so many important messages and be raucously funny at the same time. I recently listened to and loved Amy Schumer’s The Girl With the Lower Back Tattoo, and listening to Shrill reminded me of that experience. Both writers somehow manage to tackle incredibly difficult, touchy topics with their fabulous wit intact. I've never read a book that made me both laugh and think so hard.